When the last glacier melted some 10,000 years ago, the Wisconsin River swelled to more than 100 times its present size and carried billions of tons of fine sand and gravel on its way to the Mississippi River. As the meltwater decreased, it deposited material in this valley to a depth of 300 feet. This process created wide steps, or terraces, leading down to the present river bed. You are on one of the upper terraces, called a "sand barren" because of its desert-like conditions. Water evaporation rate exceeds rainfall, so plants and animals here have interesting ways to conserve water. Grasses have many long roots, and their leaves curl inwards to reduce evaporation in the heat. During the day, lizards and snakes stay under-ground where temperatures may be up to 70 degrees cooler than on the sun-baked surface. Look around for Wisconsin's only native cactus, prickly pear. The green thorny pads are actually enlarged and flattened stems. Like leaves, they convert sunlight into food, but they also store large quantities of water. Four-inch, yellow flowers bloom only one day each in late June. The Wisconsin's flood plain is located on the lowest terrace. Its moisture-loving trees have shallow roots which get oxygen during floods but also cause the trees to uproot during windstorms. A few miles north, bald eagles winter where a power plant's warm water keeps the river from icing over. Watch for eagles perching in shore trees or swooping down to catch small fish, their primary food. 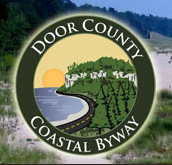 The marker is located on eastbound County Highway Y, east of its intersection with Old County Road Y, Mazomanie, Wisconsin 53560. 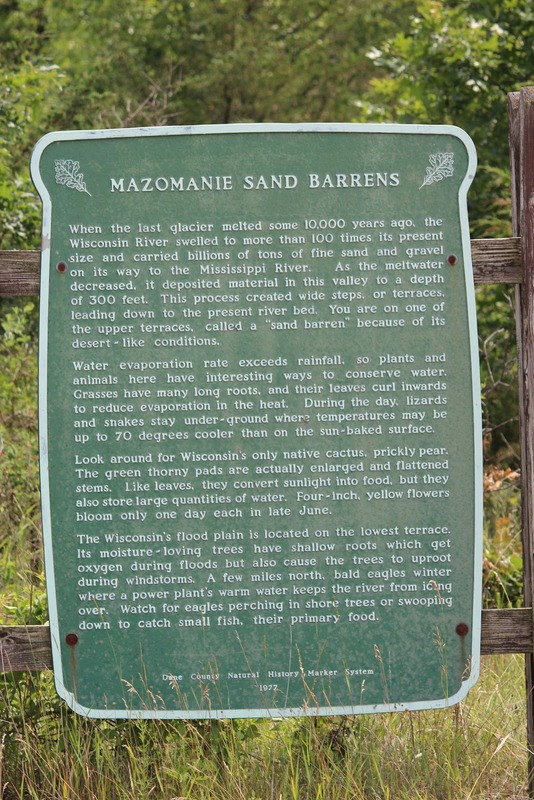 The marker is one of a series of markers erected by the Dane County Natural History Marker System. Looking east along County Highway Y . . . Looking west along County Highway Y. The marker is located near Mazomanie, Wisconsin.